Activskin® sent us a pair of their A579 Light Support Sheer Men’s Pantyhose to trial and review. You can still read Part 1 and Part 2 of our interview with Steven Katz, the Managing Partner at G. Lieberman and Sons, Ltd. The A579 style is a new product from Activskin®. It is also available as the A540 Light Support Sheer Open Crotch Pantyhose, a style that we will review separately. ‘This is a Hi-Glide™ mantyhose with a fabric that is identical to A679 but is unlike any of our other styles. Instead of a fly panel and the extra cost associated with it, it has a simple sheer male-comfort panel without a fly or gusset. The fabric glides exceptionally well, not only under trousers but also against itself. The brief provides light support, too, making it perfect for guys who want to be cool and comfortable and just a little bit of control at the abdomen. This style features a reinforced toe for added strength and durability. The fabric in the A579 Light Support Sheer Men’s Pantyhose is identical to the A679 Microfabric Light Support Sheer Pantyhose with Fly: 84% Nylon and 16% Spandex. The fabric is sheer – perhaps similar to 15-20 denier. Leg and leg hair would be visible through it. As the product description states, there is no gusset but a specially-designed male comfort panel. Toes are reinforced. 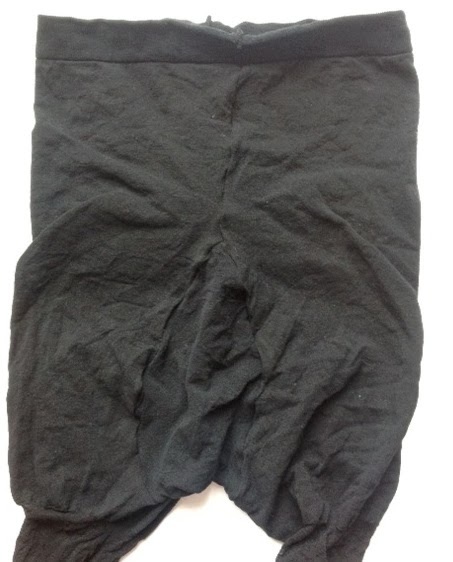 The waistband is 2.5cm wide. The brief is made of much denser fabric, with the appearance of a 60 denier opaque tight. The demarcation with the leg is clearly noticeable. The fabric has just a hint of a sheen when caught in the light. The A579s are available in four sizes: M, L, XL, and XXL. See the size chart for further sizing information. I tested the L size. These tights seemed quite delicate to the touch, but were actually surprisingly robust. The L size had a good amount of stretch and with careful positioning they fitted really well. If I was taller than my 5’10” I would have gone a size higher than the L, however. The high Spandex content provided an excellent close fit to all parts of the leg. Leg support and compression is light as described. The male comfort panel really does improve the wearing experience, with the ‘male equipment’ held in place and aligned comfortably without any pinching or tightness. Glide under trousers is also excellent and another positive feature of this style. I wore the A579s to work on a warmer February day than normal. It would have been a bit too warm for an opaque or semi-opaque style under trousers, and the A579s were a good choice for the weather. They kept my legs comfortable all day. The Activskin® A579 Light Support Sheer Men’s Pantyhose are available in three colours: Beige, Black and Tan. The A579s can be purchased directly from Activskin® at a price of $11.99. Further information on shipping costs is available on the Activskin® website. We have reviewed a very wide selection of men’s pantyhose/tights at Hosiery For Men, and it is always good to review a new style that has clearly been designed with the male anatomy in mind. The male comfort panel in these pantyhose/tights is a great feature and very comfortable. Where the A579s really score for me is Hi-Glide™ fabric which glides superbly under trousers. In summary, good quality men’s sheer tights from Activskin®, and another welcome addition to their extensive range. The price is also very reasonable.